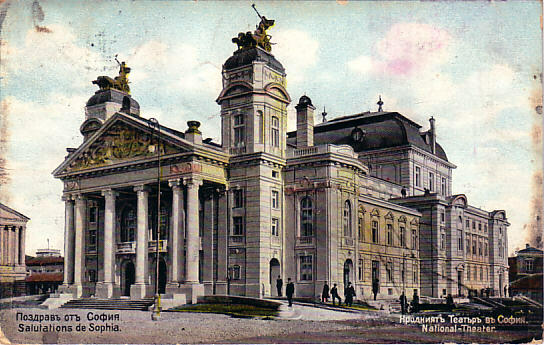 Carthalia - Sofia: Nationalen Teatr "Ivan Vazov"
Sofia: Nationalen Teatr "Ivan Vazov"
Built 1905-1906 for the Duchy of Bulgaria by Ferdinand Fellner & Hermann Helmer. 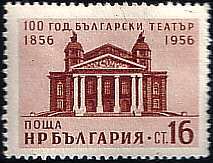 Opened 16 Jan 1907 with Dobri Christov's "Festive Ouverture", Ivan Vazov's scenic prologue "The Fame of Art" and Act V of Vasil Drumev's drama "Ivanko". 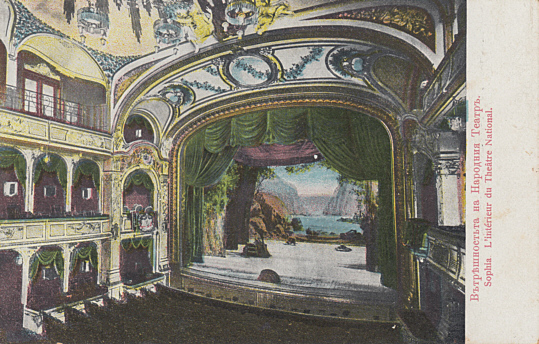 1021 seats. 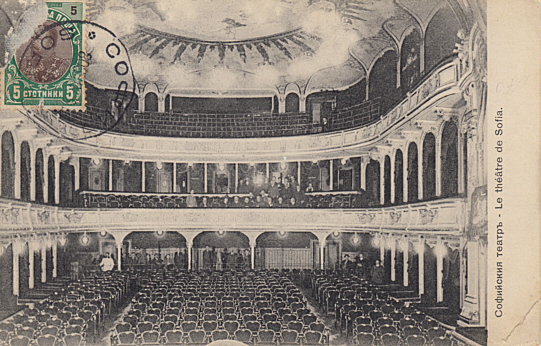 Stage house destroyed by a fire on 10 Feb 1923 (auditorium also damaged because the iron curtain did not work properly). 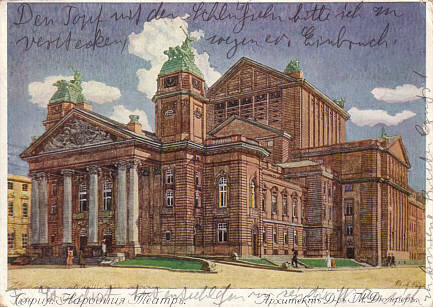 1923-1928 building of a newly constructed stage house and a slightly altered auditorium by Martin Dülfer. 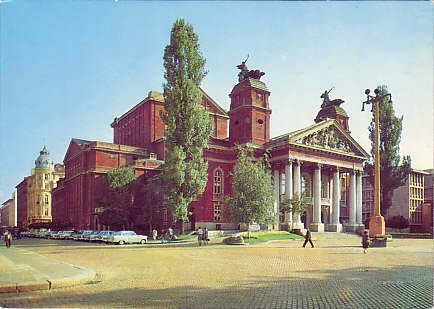 1972-1976 renovation of the stage house and exterior to the original plans by Ivan Tomov and Lilija Toteva (auditorium altered again, with only slight references to the 1906 original). 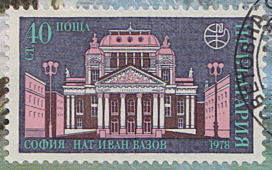 Named in honour of the Bulgarian writer and poet, Ivan Vazov (1850-1921). 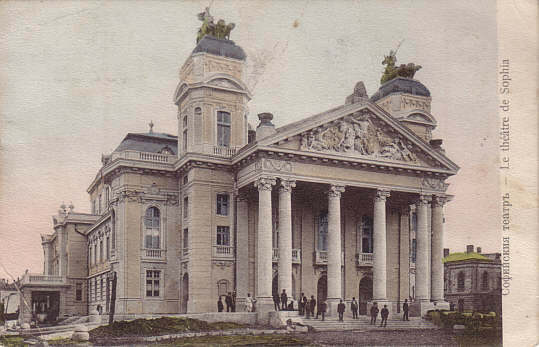 Front Text: "Pozdrav ot Sofia - Salutations de Sophia; Nrodinjat Teatr v Sofia - National-Theater"
Front Text: "Sofiskiya Teatr - Le théâtre de Sophia"
Front Text: "Vutryeshnost'ta na Narodniya Teatra"
Front Text: "Sofiyskiya teatra - Le théâtre de Sofia"
Front Text: "Sofia, Narodniya Teatr, Architekt Dr. Martin Dülfer"
Reverse Text: "Sofia, Bulgarisches National-Theater, Architekt Dr. Martin Dülfer"
Reverse Text: "Sofia - Naroden Teatr 'Iv. 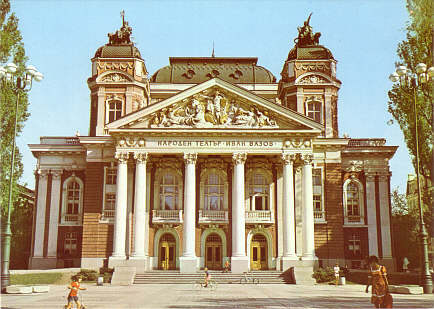 Vasov' - Sofia Théâtre National Iv. 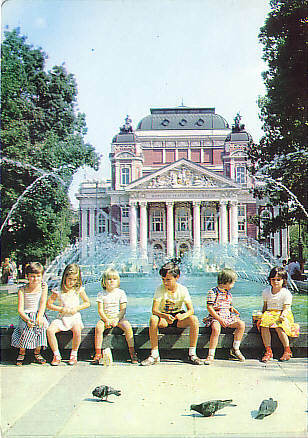 Vaozov - Sofia Staatstheater Iw. 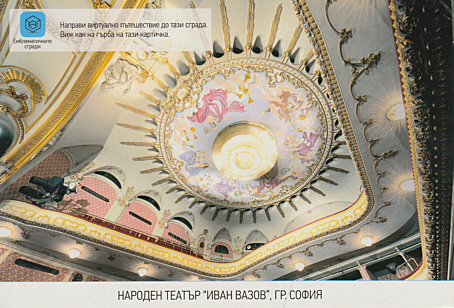 Wasow"
Reverse Text: "Sofia - Naroden Teatr 'Ivan Vasov' - Sofia Théâtre National 'Ivan Vazov'"
Reverse Text: "Sofia - Nationalen akadem. 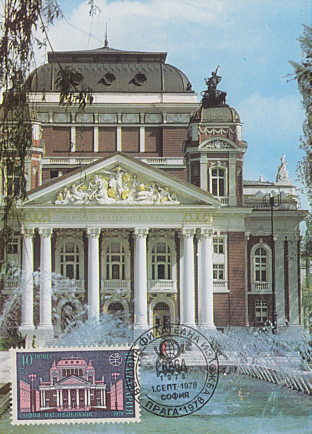 Teatr 'Ivan Vasov' - Sofia Le théâtre national academique 'Ivan Vazov' - Sofia das Nationalakademische Theater Iwan Wasow"
Reverse Text: "Sofia - Naroden Teatr 'Ivan Vasov' - Sofia Das Natoinaltheaer 'Iwan Wasow'"
Front Text: inscription: "Naroden Teatr Ivan Vasov"
Reverse Text: "Sofia - Narodniyat teatr 'Ivan Vassov', Sofia - Nationalny teatr im. 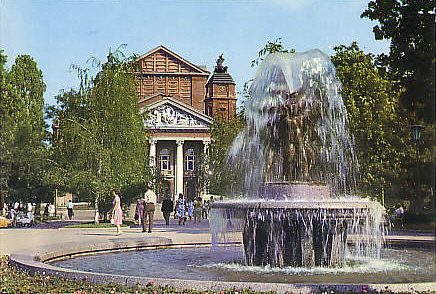 Ivana Vasova - Sofia, Das Nationaltheater 'Iwan Wasow'"
Front Text: "Naroden teatr 'Ivan Vazov', gr. Sofiya"